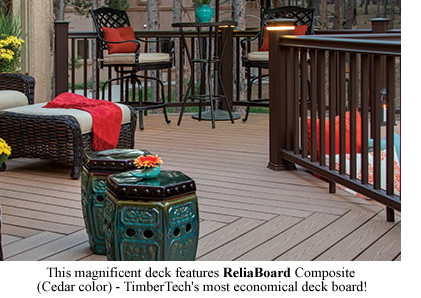 TimberTech's Composite Deck Boards are a proprietary blend of wood flour and pvc, expertly manufactured to solve many of a wood deck's shortcomings. 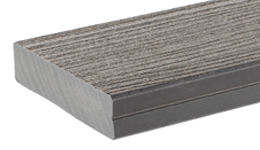 TimberTech® makes three styles of non-capped Composite Deck Boards. Each shares all of the advantages listed just below, plus each has its own special characteristics. All are available in Cedar or Gray, plus TwinFinish® also comes in Redwood. • Emulates the look of wood! • No sealing with water repellant! • 25-year limited residential warranty! 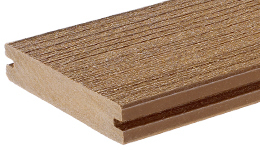 See Capped Composite Deck Boards for 8 additional advantages. All the benefits of a top quality composite deck board at a surprisingly affordable price! Scalloped bottom side, as seen in photo at below at right, saves material and thus cost, but still spans 16" on-center joist spacing. Ends are easily hidden with either Fascia or Riser, something you would probably want to do anyway for a more finished appearance. • Actual dimensions: 0.94" x 5.4"
surface, while the other side’s serrated texture creates a perfect contrast for built-in benches or planters. • Actual dimensions: 1" x 5.4"
• Actual dimensions: 1-1/4" x 5.4"
1. Lengths shorter than 12' (16' for Twin Finish Plain Edge) are not returnable unless defective.